Most of this episode is spent inside Damon’s head, trying to pull him out of a catatonic guilt spiral caused by Sybil flipping his humanity back on in the previous episode. This allows the show to do some fun cameos from long-dead friends like Vicki, Tyler, Grams, and the Sheriff. It was really, really good to see the Sheriff again, even if she spent her time torturing Caroline. One small, important moment in the Damon’s mind-journey sequences was Caroline admitting that she’d forgiven Damon for all of his transgressions a long time ago. Their past was always murkily shaded, and the show rarely wanted to confront those murky depths head on, but at least they had Caroline declare that she forgave him at least once, directly and out loud. Even if it was in a quasi-dream. The theme of this entire episode is forgiving the sins of the past, for better or worse. Stefan compelling Matt to either ring the bell that will kill thousands of people or forgive Damon for killing Vicki is the twisted example of this. Also twisted is the main moment of forgiveness, when dream-mind Damon forgives Stefan for turning him all those years ago, thus being the catalyst that caused Damon to do all the things he did. Even forgiveness on TVD is a morally complicated mess. Turns out the mystical super bell (mystical! super bell!) rips a hole straight from this world to hell, and would kill everyone in the entire town of Mystic Falls. Property values there must be really in the toilet, honestly. Matt ringing the bell looked very, very silly. A glowing magical bell is very, very silly in general. Damon asking Matt for forgiveness for killing Vicki is the capper on the forgiveness theme, and it’s a nice (if too-long coming) moment. Matt not exactly offering immediate forgiveness feels right for both the magnitude of what Damon is asking for, and also Matt’s character arc throughout the run of the series. Cade killed the Sirens, so he’s my new favorite. Overall, this was probably the best episode of the entire season so far. It took the show’s past and instead of using it to rehash things we’ve already seen the characters do over and over again, it used their past to show character growth and bring the relationships between characters full circle. Also, Damon reciting his letter from memory to Bonnie and calling her his best friend made me cry. 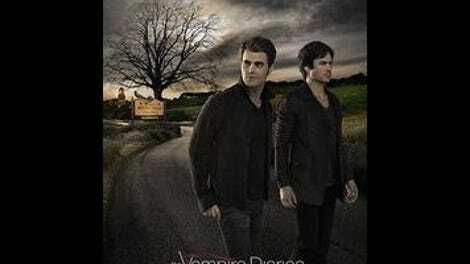 Well done, TVD.